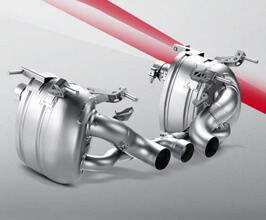 The Akrapovic titanium slip-on performance exhaust system adds power, reduces weight, and enhances the sporty sound of the Ferrari 458. Features dual-mode exhaust valves and triple exit system that delivers a crisp yet subdued sound at low rpm, but unleashes an incredible deep sound from the F1-inspired V8 at higher rpm. Akrapovic exhaust system was developed for use on closed tracks and recommend remapping the ECU in order to prevent potential check engine light warnings.